Learning how to season food properly is a skill that comes with experience. Adding too much or too little salt can leave a dish unappealing or downright inedible, so adapting at the last minute is a crucial skill. Under-seasoning is easier to fix because your diners can simply add salt at the table if necessary. If you discover you've been heavy-handed with the salt, your options aren't as straightforward. You have several ways to mask the salt's flavor, but only one real fix. Stage magicians make their living through misdirection, taking your attention away from where things are really happening. 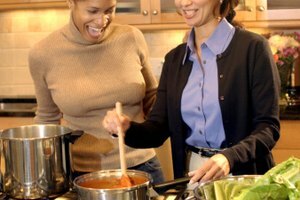 You can use the same technique in the kitchen, distracting attention from the saltiness of your sauce by adding other strong flavors. 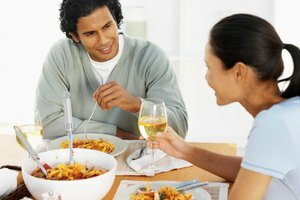 In spaghetti sauce, extra acidity is usually the best option. Adding a splash of wine vinegar or lemon juice will conceal a moderate degree of over-salting, and usually doesn't upset the flavor of the sauce too noticeably. If you find the sauce is too acidic afterwards, add sugar -- just a light sprinkle at a time -- until its taste is balanced again. 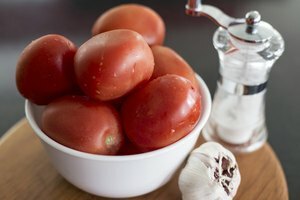 If you're partial to spicy foods, sprinkling in some chili heat to the sauce can also mask the saltiness of moderately over-seasoned tomato sauce. Add a sprinkle of crushed red pepper or a minced fresh pepper until you're happy with the result. The only true fix for over-salting is to dilute the salt by increasing your other ingredients. There are two ways to approach this. 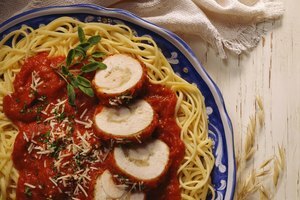 One is to ladle out a portion of your sauce -- roughly 1/3 of the total -- and replace it with unseasoned fresh or crushed tomatoes. This should bring the salt back within a normal range, and you'll just need to tweak your other herbs and spices until it tastes right. You can freeze the scooped-out sauce to use in another batch. Alternatively, make a bigger batch. Add in more of everything except salt and let it simmer until the flavors meld properly. Package up the extra sauce in meal-sized portions and refrigerate or freeze for later. This takes longer but has the benefit of leaving you well-stocked with sauce. In culinary school or apprenticeships, budding chefs are taught to season and taste their dishes at every stage of the cooking process. It's a technique that anyone can learn. When you start the sauce with onions and garlic, season them with a pinch of salt. Every time you add ingredients, taste the sauce and add salt as necessary.